Being able to clear and heal the energy of your own home regularly is one of the most empowering things you can do. Whether you rent or own, whether you live solo or with family or roommates, by clearing the home energy you can make your home a more gentle, safe, welcoming, and inspiring place. This is why I have made so many guided meditations to walk you through how to do this. Home Energy Clearing Meditation ver 2, which I just released this month June 2015, is actually the fourth meditation I’ve made for this- the latest and greatest so to speak. It’s only 15 minutes long, which also makes it the shortest meditation I’ve made to transform the energy of your home. 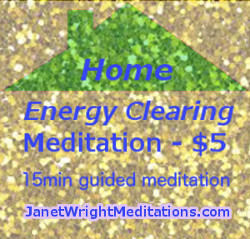 Since Home Energy Clearing Meditation version 2 is 15minutes long, it is available for $5 on this page 11-30 minute Meditations. Many people have time challenges and also inner resistance towards making time for meditation, so I did my best to pack lots of goodness in just 15 minutes for Home Energy Clearing version 2. It’s short but also potent. Here are the benefits people have experienced with these meditations. Essentially by clearing the energy of your home it’s easier to be present and well in your home. For those of you new to meditation, some of the benefits I listed may show up with just one use of the meditation, but others would require more uses of the meditation over time. Why is clearing the energy of one’s home so necessary? It’s because imbalanced energy such as your sadness or stress, your neighbor’s anger, your spouse’s worry, even mental energy left by a former houseguest could be accidentally left in a room or part of a room, which affects everyone in the home. This energy can build up for years, and can even be around from previous tenants- but it’s simple enough to clear it so why not! You can use this meditation when you are in the home but also you could do it from anywhere. Young children are especially sensitive to the energy of their home. They are too young to have solid spiritual boundaries, so they are like big sponges towards their parents and also towards any energy in their home. Very young children also have very obvious symptoms when they are bothered, such as screaming and crying instead of sleeping, acting out in school, etc. This is why my clients that are parents have been some of the most motivated to use these home energy clearing meditations. As an adult your home may not make you scream and cry, but you would likely have more inner smiles, peace, and productivity when the energy of your home is safe and flowing and grounded. So this is the fourth meditation? It’s version 2, so what are the two others? In early 2014 I made Spring Cleaning Part 1 & 2 recordings which are recordings of live webinars I did. Each is over 1hr and are still available on this page 1 hour Meditations for $5 each. If you are really gung ho and time is no issue, then Spring Cleaning 2 still has some elements that did not make it into Home Energy Clearing ver 2 regarding clearing emotions & fear to clear clutter so it’s still worthwhile. Of course ideally you would heal your own energy regularly, and also the energy of your home somewhat regularly. This Home Energy Clearing version 2 meditation makes that easier as it combines both self-healing and personal grounding, and grounding & healing or clearing the energy of your home. That way on the day that you want to heal your home you and yourself, if your time for meditation is very limited, you could just do one meditation for both! Any questions or comments about this post or this meditation? Go ahead and share them as comments below. Any suggestions for future posts can also go below. If you prefer to post your comment anonymously it’s possible. Just make up a name and email address.